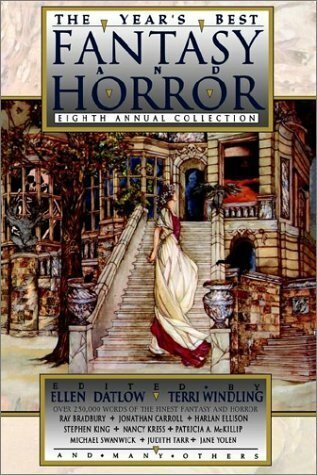 The Year’s Best Fantasy and Horror: Eighth Annual Collection, ed. by Ellen Datlow and Terri Windling, St. Martin’s Press, 1995, ISBN 9780312132200, 624pp. Jill and I were having a discussion about reading preferences. She likes big thick books, typically, and I profess that I don’t, although the books I name as my favorites all tend to be fairly hefty ones (The Gold Bug Variations, Possession, and Stand on Zanzibar, to name three). What I do like, that J has virtually stopped reading except in special cases, is short stories. Thinking about this, what I decided was my attraction in a story was a strong beginning and strong end, something you get a lot more of with short stories (where, in certain cases, are just beginnings and ends), yet can also be found in certain books. It’s not that I don’t like the middles of stories, but I’m a structuralist, and if a story starts off strong and finds a way to tie it up all together at the end, I’ve found what I’m looking for. It also explains why I don’t tend to like “mainstream” fiction all that much, which is often just about the characters, i.e., the middle, and which the structure of beginning and end matters little. So the publication of these large volumes of short stories is a regular purchase for me, enabling me to forego the magazines, which–to read in the kind of breadth and width brought to this collection by editors Ellen Datlow and Terri Windling–would be ruinously expensive. I tend to like Datlow’s picks better than Windling, that is, if the initials on the introductions indicate which woman picked which story for the volume, and I think that’s because my tastes have always been more in line with Datlow. While both editors try to break free of the genre for at least a portion of their selections, Windling seems to have a certain stable of writers whom she can’t stop from including–Jane Yolen and Charles de Lint come to mind–that I have never found as strong as she does. The highlights in this volume include Stephen King’s “The Man in the Black Suit,” a Faulkner-influenced meet the devil tale that benefits from King’s ability to write colloquially; Neil Gaiman’s “Snow, Glass, Apples” which is like Gregory Maguire’s Wicked in its ability to reframe a couple of well-known fairy tales so that the reader discovers that history is written by the winners; William Browning Spencer’s “The Ocean and All Its Devices,” wherein the Cthulhu mythos is reinvigorated; David Garnett’s “A Friend Indeed,” one of the best twist-in-the-tail stories that I’ve read in a while; and “Superman’s Diary” by B. Brandon Barker, where Clark Kent finally wins the day. I liked some of the others, which tended to have great beginnings but weren’t able to end to my satisfaction, including Bradley Denton’s “A Conflagration Artist,” Ian McDonald’s “Blue Motel” and Jack Womack’s “That Old School Tie.” While I’m glad the editors include poetry, once again I wasn’t impressed with the selections.